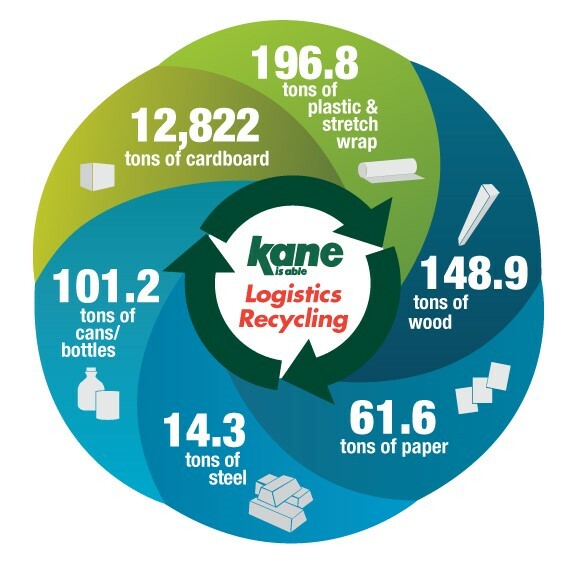 KANE is committed to reducing carbon emissions, pollution and congestion with smarter trucks and delivery methods. KANE’s Collaborative Distribution program, for example, pools the inventory and shipments of middle-market consumer goods manufacturers so common retail customers can receive fewer, larger shipments. This reduces distribution costs as much as 35% and also reduces emissions, as the same volume of goods is delivered using fewer trucks. Read the Sun-Maid Story. Own and operate CNG-powered vehicles that produce up to 20 percent fewer greenhouse gas emissions and significantly less smog-producing pollutants than petroleum-fueled counterparts. A Tier 1 transportation management system is used to optimize freight consolidation and routes, reducing trucks on the road and fuel consumption. KANE facilities couple energy-efficient T5 lighting with motion sensors. T5 lighting lasts 2-3 times longer than metal halide lamps, generating savings of $260,000 dollars and 3.5 million kilowatt-hours annually. KANE’s sophisticated contract packaging capabilities enable companies to integrate final packaging into distribution operations. That eliminates freight runs to and from outside packagers, greatly reducing time, cost and carbon emissions in the overall green supply chain. Read the Kimberly-Clark case study.